Villains have a tough lot in life. Of course, many of them are truly evil and spread endless carnage and wickedness throughout the world out of a crazed sense of power or simply because they enjoy being a nasty menace. But, some of them are legitimately misunderstood or, worse, under the affliction of a madness that they cannot control. Such beings act out in horrifying actions until they are fortunate enough to find themselves in the hands of the one person who can manage to struggle them back to the edge of sanity and, bound together, can turn the coin on its end and bring about some real heroics, instead. Such is precisely the case for the mysterious and terrifying ooze-like parasite creature that turns people into the savage Venom! Ready to pounce and tear with mutated teeth and an uncontrollable rage and hunger, Venom was bound to be some of the worst the world could ever face until he finally met with the right sort of would-be hero who could bond into a real symbiotic relationship! Now, your kiddo can step into the role of a dark hero as Agent Venom, an in-control and ready-to-save-the-Galaxy kind of symbiote! 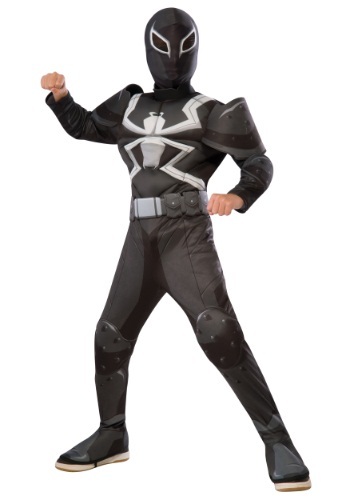 Your little hero will be ready to accept the most dangerous of missions… or at least the most exciting of candy-offering streetsides in this polyester jumpsuit with polyurethane shoulder armor, a foam belt, and the iconic spider-like Venom symbol across the chest. The mask fastens with the mighty force of Velcro in the back. Show the world that Venom didn’t mean any harm with this total transformation.